AISC Approved Plasma Cut Bolt Holes. These test results have proven even our roughest location of 60 µin is still 5 times better than the permitted roughness of 1000 µin. The overall Average was 41 µin cutting 4 holes, and testing at 4 locations per Plasma cut bolt hole that result in a roughness 24 times better than required by ASIC. 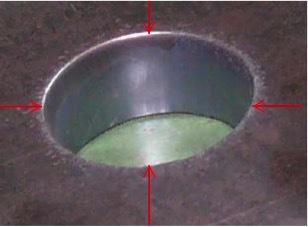 The Evaluation was performed on the plasma cut surface of the holes, at 4 different locations per hole. Our competition only checks 2 locations. Lab results included in this documentation. Daito Test results are a direct reflection as to the unrelenting commitment to the high quality equipment that Daito has been building for over 56 years. Daito has been perfecting the plasma robot for structural steel and its ability to plasma cut bolt holes, ever since we participated in the 2005 Montreal NASCC (AISC) with the first prototype CR1040 plasma robot. Since that time Daito has been updating the construction, software, cutting systems, robot and overall machine for the quality of cuts you see in these tests. DAITO is your only choice when it comes to high quality metal work machine tools for structural steel industries. Contact us for expert knowledge and advice. With over 30 years experience, Industrial Machinery Sales & Service Pty. Ltd. have grown to now represent many of the worlds leading metal working machinery brands and solution providers. Specialising in machines for Metal Fabrication, Sheetmetal, Metal Cutting and Engineering Machine Tools. In our extensive product range, its fair to say, we would have a machine or system that could be used to help regain your competitiveness, improve your efficiency or production and that would lower your overall cost.